524 pages | 239 B/W Illus. Ceramics and refractories cover a wide range of fields and applications, and their relevance can be traced as far back as 24,000 BC to the first man-made piece of earthenware, and as recently as the late 1900s when ceramics and ceramic matrix composites were developed to withstand ultra-high temperatures. 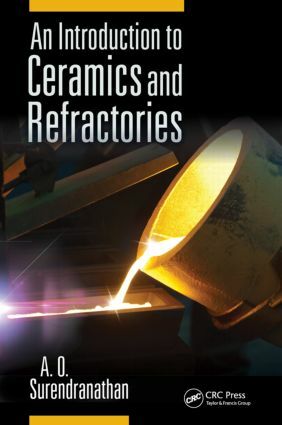 Beginning with a detailed history of ceramics, An Introduction to Ceramics and Refractories examines every aspect of ceramics and refractories, and explores the connection between them. The book establishes refractories as a class of ceramics with high fusion points, introduces the fundamentals of refractories and ceramics, and also addresses several applications for each. The book details applications for natural and synthetic ceramics, as well as traditional and engineering applications. It focuses on the various thermal and thermo-mechanical properties of ceramics, classifies refractories, describes the principles of thermodynamics as applied to refractories, and highlights new developments and applications in the ceramic and refractory fields. It also presents end-of-chapter problems and a relevant case study. Addressing topics that include corrosion, applications, thermal properties, and types of refractories, An Introduction to Ceramics and Refractories provides you with a basic knowledge of the fundamentals of refractories and ceramics, and presents a clear connection between refractory behavior and ceramic properties to the practicing engineer. Dr. A. O. Surendranathan is a professor in the Department of Metallurgical and Materials Engineering, National Institute of Technology Karnataka, India. His academic qualifications are a BSc, AMIE, ME, and a PhD. He has seven years of research and twenty-nine years of teaching experience. Dr. Surendranathan has presented and published more than 100 papers and has received numerous medals, awards, prizes, and honors. He has chaired technical sessions at conferences and has been a member or office holder in eight professional organizations. Dr. Surendranathan’s foreign assignments have included travel to Ethiopia, Australia, and the United States.